Most students these days usually don’t score well even though they answer all the questions, this is due to several factors that aren’t within our control as students. Therefore knowing the factors that are within our control becomes very important. The things that are in the students control are the time given to prepare for the examinations, the way you learn, understand, recall and reproduce the matter studied and the way you answer the paper. Tip 1. Time Management: students need to use the time given to prepare for the examinations effectively if they wish to score well. If students are prepared before hand for the examinations the exam usually goes well and the chances for students to score well also increases. Tip 2. The Learning Techniques Used: if students make use of memory improvement techniques such as Mnemonics this will help them to prepare the matter well thus increasing the quality of the answers written. With proper memorizing techniques the matter will be remembered well and the student will be able to recollect the matter studied as well. Apart from this if students use charts, flow charts, diagrams and prepare hierarchical diagrams to memorize points on the basis of their importance this will by default improve their grasping power thus the outcome of the examination will be good with the marks that they deserve. Tip 3. Presentation: the way you present your answer sheets plays an important role because it eases the work of the professors that check the papers. Therefore most teachers insist on writing the papers neatly and highlighting the important points if there is some time remaining. Organizing the matter is another aspect that adds to the presentation of the paper. Tip 4. Organize the Information: most paper checkers look for the way the student organizes their matter while preparing for the examinations. They realize this by the way the student answers the questions, because if the information is written well the information is usually organized. Since, the information is organized it is probably why some students score well while others do not. Therefore, students should try and organize the matter studied as this will be reflected in the answer sheet thus the examiners feel good to check such papers. Tip 5. Draw and Label the Diagrams: it is preferable to draw diagrams for questions as and when applicable. Students should ensure that their diagrams are labeled appropriately. This helps you to recall the information that you have studied and also serves as a blue print to all the points discussed. This activity helps examiners to understand the matter that you plan to cover under the question and also helps students to not miss anything out. Tip 6. Scoring: the examiners usually give marks on the basis of the points covered. Even if students mention the various points via the use of diagram and it they are unable to recall all the information discussed in the point they still give marks based on the points mentioned. For instance if a question has 5 points and 5 marks are allotted to that question then students usually get all the marks if the points are correct. This activity also indicates the way the information is organized and the examiners are more than happy to correct such papers. Tip 7. Answering Questions: in your answer sheet make sure you number your answers correctly. Students should stick to the order of the question paper when answering the questions. It is preferable to answer the questions according to the question numbers given in the question paper therefore it is preferable to leave space for questions that students aren’t sure off. Students can always come back to the questions that they missed or they were unsure of at the time, this reduces the examiners work. When choosing questions try to solve questions that have numerical in them rather than answering theoretical questions as the chances of doing well are higher. This holds true for subjects like Physics and chemistry which comprise of both theory as well as numerical. Make sure that you read the questions carefully before attempting them because many a times students make silly mistakes like numbering the questions and the answers incorrectly. At times students haven’t read the questions properly and they realize that their answer is wrong. Ensure that you write answers on the bases of the marks allotted to the questions to minimize the time taken to complete the paper. 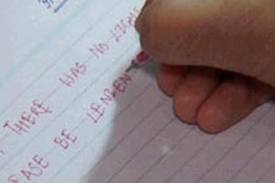 Students should be careful to do the rough work if required in the answer sheet on the right hand corner and keep it neat. Remember to refrain from writing anything on the question paper or you marks will be cut on the assumption that you were copying the whole time. If you insist on writing something then at the most you can make a note of the answer that you have got especially for papers like Mathematics, Algebra, Geometry, Trigonometry, Physics and Chemistry. The exam tips mentioned earlier are the factors that are usually within our control as students therefore paying attention to these points is very important if students wish to score well as these are general exam tips that most institutes follow. Nevertheless, the information given is institute specific and is to the best of the writers knowledge. Therefore, it is always preferable to enquire about these points with your professor as your teachers at times correct the papers of the students hence they will be able to give students proper guidelines for the same. Students need to realize that they don’t have any control over the marks they obtain as they are not the ones who correct their papers. Apart form this there are several factors that come into play when marks are given, to name a few the kind of person checking the paper, the mood of the professor after correcting the previous papers and the answers given by these students before he / she comes to your paper etc. are some of the other factors that are not in the student’s control. Another aspect that student’s need to keep in mind is as long as you have done your best and you put your trust in God, everything is going to be just fine.